An incident in Komi republic, in northern Russia, resulted in an oil spill. Local environmental groups raised the alarm, but the pipeline operator only learned about the incident from media reports. 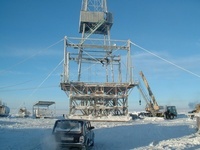 According to environmentalists from the Committee to Save Pechora, it was practically impossible to reach the site of the accident since LUKOIL, the pipeline operator, set up a traffic barrier blocking access to the town of Neftepechorsk. Only those with passes issued by the company could get through. Environmentalists managed to reach the site of the accident and take water samples. They also spoke with the local population. Residents of the town of Van-pi told them that they had seen a large fire and black smoke, like from petroleum, on the frozen Pechora River on December 27-28th. According to information gathered by environmental groups, the pipeline accident was a major one and occurred on December 19th. 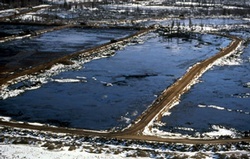 As a result of the accident, a liquid containing petroleum poured into the Pechora River. Representatives of the Committee to Save Pechora told the Russian press that a cleanup operation was under way on the banks of the Pechora River from early in the morning until late in the evening. They also said that people were working on the ice with chainsaws at the place where the drainage from the pit entered the river, which, in the opinion of the environmentalists, was evidence that they were sawing away ice contaminated with oil. In an interview with Bellona.ru, the press service of LUKOIL-Komi said that “the environmentalists were greatly exaggerating the circumstances and had inflated the situation into a full-blown tragedy.” The oil company refuted the information provided by the environmentalists, even regarding the time of the spill, confirming that the accident happened not on the December 19th, but on December 23d. According to the oil company, no oil spilled into the river. “LUKOIL-Komi has existed for only seven years, while the pipeline has been around for 30 years already,” said the company’s press service, commenting on the reasons for the accident. It should be noted that neither the Ministry of Natural Resources and Environmental Protection of the Republic of Komi nor the Agency for Supervision of Environmental Management could give Bellona.ru any information related to the accident. The Republic of Komi is sadly aware of the environmental disaster that occurred as the result of a pipeline accident in 1994. According to a variety of sources, the amount of oil that spilled out through multiple holes in the old pipeline was between 100,000 and 120,000 tons. According to the official version, only 60,000 tons of oil spilled into the environment. At that time, news agencies from throughout the world reported on the tragedy in Usinsk, while only the local oilmen pretended for a long time that nothing had happened. They tried to clean up the results of the spill for about a year, but even years later, the quality of the cleanup operation carried out was drawing complaints from local residents.